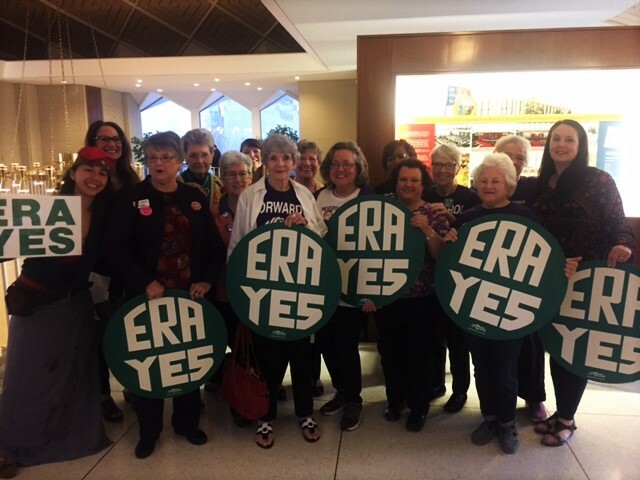 Take Action to Ratify ERA in NC, with the ERA NC Alliance, of which NC NOW is a lead member. Join us in person in this action, and you can also call or email from home. One more state. Not one more generation. We urge you to participate in ERA-NC Advocacy Day on Wednesday, June 27th at the NCGA in Raleigh. This CALL TO ACTION comes on the heels of Illinois becoming the 37th state to ratify the Equal Rights Amendment (ERA) on 5/30/18. Only one more state ratification is needed to amend the US Constitution. NC is now the face of the national conversation. Our state is poised to make history, becoming the 38th and final state needed to push the passage of the amendment over the top. Gather on the first floor, in the 1300 quadrant, which is to the left as you enter the building through the Jones Street entrance. This entry was posted in Equal Rights Amendment, ERA, ncga interference and tagged Equal Rights Amendment, ERA, ncga interference. Bookmark the permalink.